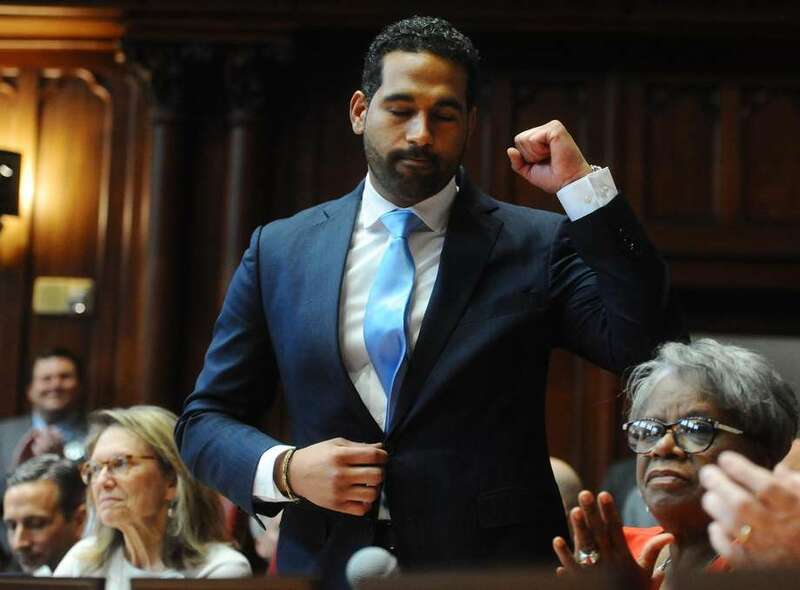 State Sen. Dennis Bradley, D-Bridgeport, pumps a fist after being introduced during the opening session of the senate in January. HARTFORD — A bill that would erase criminal records to eventually give those convicted of crimes a better chance at landing jobs and finding places to live following completion of their sentences passed the Judiciary Committee 21-19 Tuesday. The so-called “clean slate” legislation now heads to the Senate. The original bill was amended to ensure those convicted of sexual and domestic abuse and that those convicted of a felony have the burden of proving to the Board of Pardons and Paroles that they deserve to have their records expunged. Bradley said the law will help minorities, who he said represent a large percentage of the people in the court system — something he said he knows well as a lawyer who has spent much time in the Bridgeport court system. “What we don’t want to see, because you are a person of color and because you are poor, that a conviction follows you forever,” Bradley said. Sen. Gary Winfield, D-New Haven, added: “We hope this allows people to come back to society and participate fully,” without fear of their past records hurting them in seeking employment or other aspects, such as finding housing. But the issue isn’t as cut and dried for some members of the committee. Rep. Stephen Harding, R-Brookfield said there are a “plethora” of crimes that would be “wiped away” under the bill. He listed criminally negligent homicide and assault as crimes that would be automatically expunged. “No input from the victim — just wiped away, no consequences, nothing,” Harding said. Rep. Maria Horn, D-Salisbury, a former prosecutor who supported the bill, pointed out that the automatic expungement only occurs years after someone completes their sentence. The Judiciary Committee also approved a bill that would ban the use of solitary confinement in state prisons. The bill banning the use of solitary confinement received bipartisan support from lawmakers who said that the practice, especially on the youngest inmates, hurts public safety more than it helps it. “Sixteen, 17- and 18-year-olds confined 23 hours at a time — I believe that is outrageous,” Sen. John Kissel, R-Enfield, said. The Correction Department has continued to put youthful offenders in solitary confinement in adult prisons in Connecticut despite the passage of legislation prohibiting the practice in 2017, Child Advocate Sarah Eagan told the Judiciary Committee during a public hearing on the bill. Rep. Robyn Porter, D-New Haven, said while many are focused on the issue of solitary confinement being used on young people, she believes it bad practice for people of any age. “If we did to animals what we did to people you would be facing prison time for animal cruelty,” Porter said. In other action, the committee also passed a bill that requires the Chief State’s Attorney’s Office to annually provide all arrest and sentencing data for public view. The bill also would allow defendants to have legal representation during parole revocation hearings. Current Chief State’s Attorney Kevin Kane testified previously that he supports a revised version of the bill that was crafted with input from the Judicial Branch, the Office of Policy and Management, the Office of the Chief Public Defender, and the Connecticut American Civil Liberties Union. The first part of the bill would require the Division of Criminal Justice to gather all information on arrests and sentencings including the demographics of the defendants, the number of continuances and pre-trial proceedings, information on plea agreements, and the number of trials. The second would provide legal counsel through the state’s public defender system to all sentenced defendants who are facing parole revocation. The bill now also goes to the Senate. Another bill headed for the Senate is one proposed by the Connecticut Innocence Project that would limit the testimony of “jailhouse witnesses” by requiring prosecutors to demonstrate that the evidence provided is reliable. The bill, which also is supported by the Connecticut ACLU and the Chief Public Defender, would allow defense attorneys to seek a hearing on the reliability of the testimony of “jailhouse witnesses” who would testify at a trial. Prosecutors would be required to provide detailed information on the witness’ criminal background, including any pending cases, any other cases during which they testified and what benefits they received for testifying within 45 days of a defense attorney’s request. The bill relates to only murder and sexual assault cases that are slated to go to trial, said Michelle Feldman, State Campaigns Director for the Innocence Project. A review of the testimony and evidence, including whether it could have been obtained by means other than from the defendant, would also undergo the scrutiny of a judge. The prosecutor would have to show by a “preponderance of the evidence,” that the jailhouse witness’ testimony was reliable or a judge would not allow the testimony to be admitted. The purpose of the legislation is to protect against wrongful convictions and help the state maintain rightful convictions, Feldman said.